Figured now that I’ve got most of the mutants out of the way (they were really wearing on me) I thought I’d really switch things up a bit. Not so much on the “super” side of heroes, but still a pretty good read. 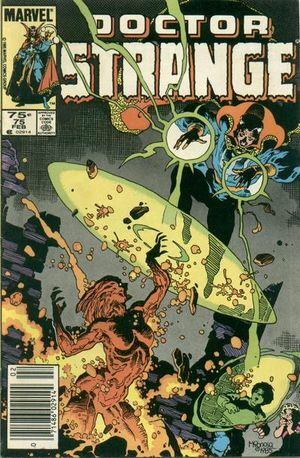 Great cover by Mike Mignola certainly helped things as well. Interesting enough, I ended the last issue of X-Factor Annual #2 with Franklin Richards, and we started this issue with Franklin kidnapped by Mephisto. Weird stuff, especially considering there’s a bit of a lapse (year-and-a-half) between issues. This kid’s in high demand. Anyhow, turns out Franklin Richards is some pretty powerful stuff. We seem to be picking up in something that was continued from #74, but we’re caught up quick. At first it looks as if Mephisto is siphoning power from lil’ ‘ol Franklin, but there’s actually something to do with the sun and an evil dark nebula powering the dark one. Doctor Strange frees Franklin from a crystal prison, and boy-howdy, does Franklin put a whooping on Mephisto. This hurtin’ is part and parcel because at that moment the nebula is rendered harmless by outside forces (as seen in ROM #65) but boy this kid packs quite a punch. Freed from Hades, all return home. More on that later. Doctor Strange goes back to the Village and walks in on his bookkeeper who is having an awful time with simple math. Turns out she’s frustrated by personal matters, namely the hots she has for the good Doctor’s sidekick, Wong. She and Wong bonded over discussion of Doctor Strange when he was in the pits during his break-up. Turns out Wong’s got feelings, too, but he’s been betrothed to someone that’s not even born yet. This is not faring well for love this issue. Love triangles aside, something has escaped from its Hadean prison (I loved seeing this in print) and is terrorizing a neighborhood in Connecticut. Doctor Strange has sensed something of great mystic power breaking through to our reality. He unleashes all his special tricks (I’m sure I’ll get used to the terminology in the next few issues) to figure out what’s going on. Turns out water is a deterrent to this baddie, and we find wrapped up in this monster a woman named Topaz who has been freed. But only half of her! They need to find the missing half…of her soul!